In March Google announced that by 1st of July Google Reader will cease to exist. I am sad to say this, but after half a decade so will NewsRob - as we know it today. My day job and my health don't really allow me to spend enough time on NewsRob to keep it going forward. Because I didn't want to let the NewsRob community down for some time now I fooled myself into believing that there is a practical way to keep things going forward, but this is just not the case and you and I have to acknowledge that. Please accept my apologies for the inconvenience it causes you. And thank you for staying with me and NewsRob for so long. I know a few users by name who used NewsRob since the beginning of 2009 until now and we meanwhile know each other on many different levels. 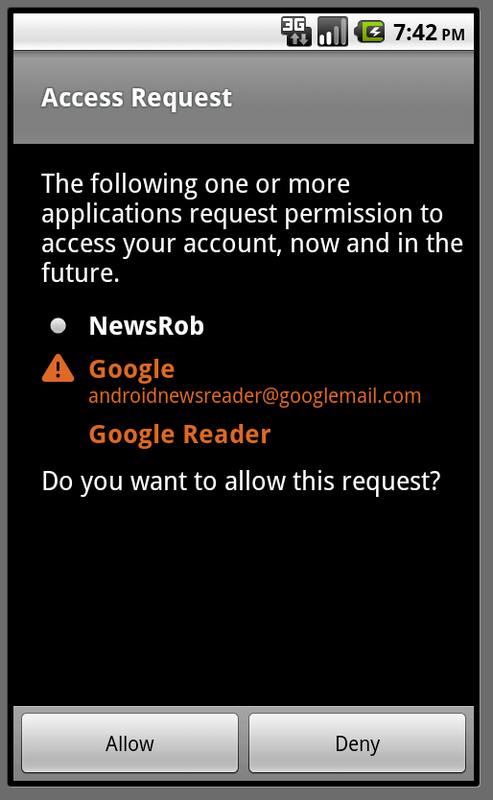 So alongside Google Reader the name NewsRob will disappear, as will the apps on Google Play. A little later this blog and the mailing lists will go away too, but I will keep them open for now as point to coordinate follow up activities. However after unpublishing the app and letting go of the NewsRob name, something new and more exciting may be around the corner. I published the source code under the MIT open source license. At some point a new RSS reader may emerge as a whole. Or some features will surface again in other RSS readers. A likely candidate for this would be the offline capabilities, which are pretty well encapsulated. In the same way that Google pulling out of the RSS reader market may likely turn out to be a blessing in disguise, so will me letting go of the code that was NewsRob hopefully result in other people taking over. People who will give it the attention that it deserves and that I can't devote at this point in time. 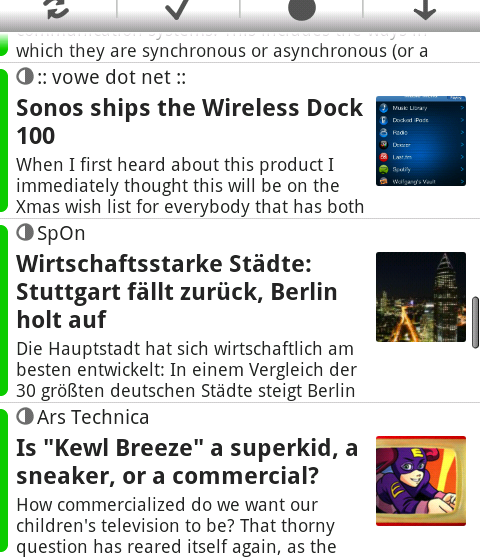 Travis already works on an integration of NewsBlur and published a functional beta. He agreed that his contribution is also part of the code repository I linked too. If you want to have a look around what else is happening in the RSS arena, you may find this article useful as a starting point. NewsRob was initially published roughly two years ago and now enters its third year of life ;) It has been a great time and I'd like to use this occasion to offer NewsRob for €1.99 (€2.37 incl. Tax in the EU) until the end of February. If you just very recently purchased NewsRob for the full price and feel cheated now, please contact me: mariano.kamp@gmail.com. 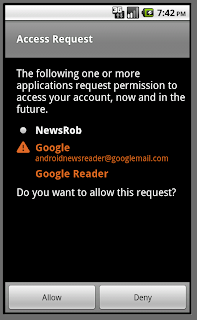 You now subscribe to feeds in Google Reader from within NewsRob. Either you select it from any article lists' option menu or you send a link to NewsRob from another app or NewsRob itself. The subscription dialog shows you a list of possible feeds for your keywords and works interactively. The actual fetching of new articles happens in the background during the next sync. This is the implementation for the #3 feature suggestion at uservoice. Unfortunately AdMob dropped the support for narrow ads in their current SDK. As this was the only reason to still use AdMob, those ads are now replaced by Google Ads. NewsRob was showing Google Ads already on the bottom of the lists, but will now also do that on the article detail view. Those are a bit taller than the narrow AdMob ads. To sweeten the deal the full screen mode of NewsRob is now available in the free version too and in full screen mode you should now have more space than you had before. You can toggle the full screen mode with a double tap on the content area. 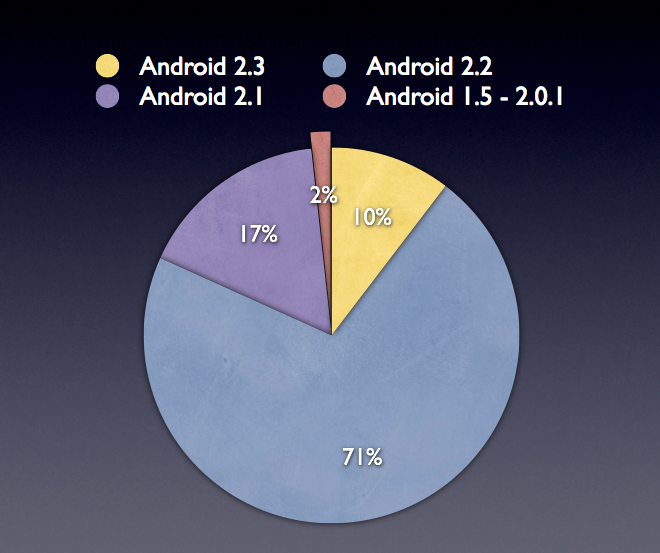 Meanwhile there aren't that many Android devices accessing NewsRob anymore that run an Android Version below Android 2.1. 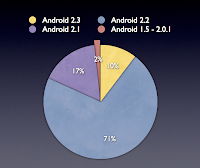 See the graphic on the right for a distribution of Android versions for NewsRob Pro. As a consequence I am now dropping the official support for versions below Android 2.1. 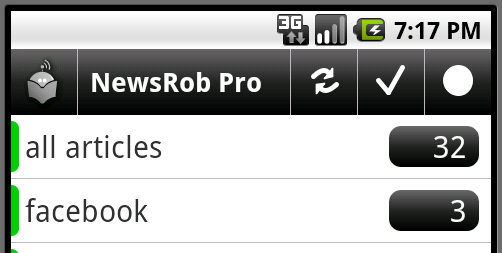 This is the last version of NewsRob that is available for older Android versions and will be frozen. Hopefully that strikes a good balance between moving forward and not leaving the users of old versions totally behind. 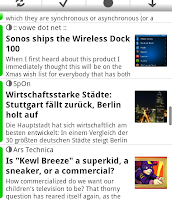 NewsRob kept compatibility with old Android versions for quite some time and to some extent will continue to do so. However this comes at a cost and as meanwhile there are only a few users left who use NewsRob on Android 1.5 - 2.0.1 devices, this cost became harder and harder to justify over the last releases. To pick up speed with development the support for the older Android versions will be dropped from the main version of NewsRob. However to make sure that you are still able to install NewsRob and get an update when I discover a very critical bug, a new version of NewsRob is on the Android Market for devices running older versions of the AndroidOS. Please install the new version using the button below. 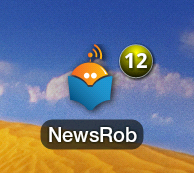 You then need to uninstall the current version of NewsRob. If you have the Pro version of NewsRob this will also be recognized by the new version. Also your per-feed settings will be picked up by the new version, but you need to login again and configure the basic parameters. Thanks! – Waiting for you on the other side. It seems that the new authentication – introduced in the previous release – works well for the vast majority of NewsRob users. However as there were a few disgruntled one-star-comments on the Android Market I'd like to say again that this only works for proper Google accounts. These are all accounts that end with gmail.com or googlemail.com as well as the Google Apps For Your Domain accounts that Google already migrated. If you don't have one of those, please continue to use the classic method. Well, if you didn't read the previous release notes explaining that, you probably aren't reading these either and I am preaching to the choir ;) Anyway, there is also now a hint text on the account list / login dialog. A lot of small performance/responsiveness improvements went into this release. Please come to the mailing list if you still see a black screen or an Application Not Responding dialog. Another small enhancement should be valuable for web comics. When "Image Fit-To-Width" is enabled the resizing will be done again when changing the orientation of your device, at least until you first scroll into the article. The new version now sports a richer article list. If possible it contains a snippet of the article and a thumbnail of a significant image from the article. Snippets will be prepared during the import of new articles. So if you want to see this new feature in full action right away you should do a Clear Cache / Sync. When NewsRob is configured to automatically sync in the background it already obeys the global, system wide, background data setting. With this version NewsRob will also obey the global auto-sync setting. You can now conveniently turn off all automatic syncing (Gmail, Facebook, NewsRob ...) in one place. It might be confusing that now syncing can be turned off in more than one place. To prevent this confusion NewsRob will now warn you when auto-sync has been disabled globally, but is enabled in NewsRob. For the programmers amongst you: When turning the global auto-sync setting back on I would like NewsRob to check if the last sync is longer ago then the configured interval. If that is the case it should run a sync right away. However I don't know how to get notified when the auto-sync status changes and so I can't implement it at the moment. If you do know, please leave a comment or come to the list: http://bit.ly/nr_list. To prevent accidental swipes, e.g. left-to-right to mark an article read on the article list, swipes must be now more explicit. This means that the direction of the swipe must be more pronounced. To mark an article read you still must swipe from left-to-right (at least 45° to less than 135°), but also the horizontal movement of your finger must be significantly longer than the vertical movement. Twitter changed their URL scheme and it broke some of the links in feeds when shown in NewsRob. This should work correctly again now.